Crash diets don’t work – if you lose it quickly you will put it back on just as quickly. Losing weight too quickly makes your body think it is facing potential starvation and will go into survival mode! Your fat stores will be protected and any weight loss will only be water and muscle. You might enjoy a good few weeks thinking that you are losing weight but you will end up frustrated when it all comes back again. Stop skipping meals right away, especially breakfast. The best way to enjoy and maintain your idea weight is to train yourself into a new weigh of life. I get so annoyed with all the different weight loss options out there that are so very expensive and just plan unnatural! 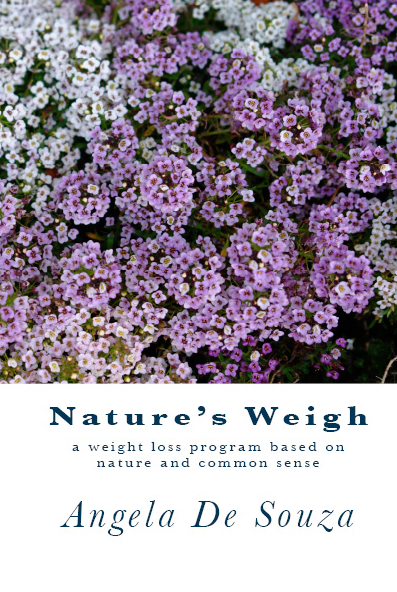 So I have written my own weight loss program based on nature and common sense. This method has worked for me all my life. 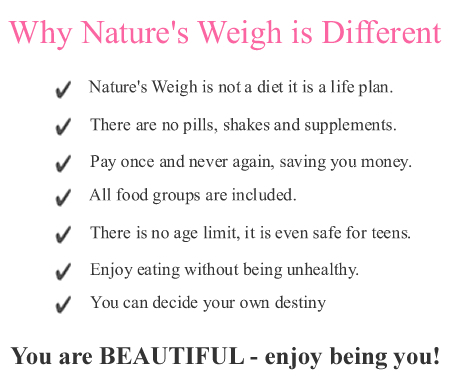 Why spend a fortune when Nature’s Weigh can give you each step for only £20. Why stress yourself out with a sudden complete change of lifestyle, when Nature’s Weigh helps you lose weight naturally and gradually. So here it is. Go through the program one step at a time, even if you buy them all at once, don’t skip ahead or else it won’t work. 7 easy steps that WILL work if you stick to the plan! Find out more about other books in the Nature’s Way series.